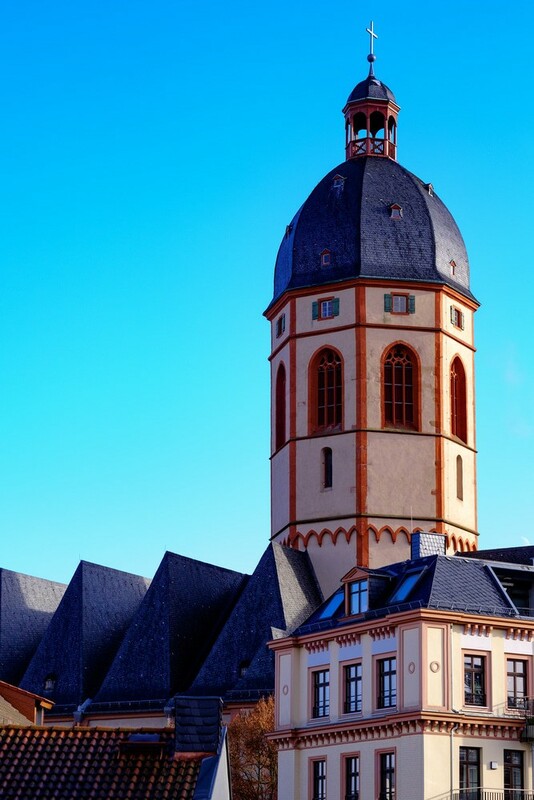 Germany’s wine capital, Mainz was founded by the Romans on the left bank of the Rhine and has more than 2,000 years of history. Looming over the Altstadt’s romantic warren of cobblestone streets is the huge Romanesque cathedral, burial place for centuries of ruling Prince Archbishops. The city’s museums have Roman artefacts discovered beneath the city, like a small armada of 1700-year-old warships now kept in an industrial locomotive shed. In the 1430s the Mainz citizen Johannes Gutenberg invented the printing press, and the museum dedicated to him has two of the remaining editions of the Gutenberg bible. Mainz also puts on a big-time carnival, and its televised parade on Shrove Monday pulls in hundreds of thousands of spectators. 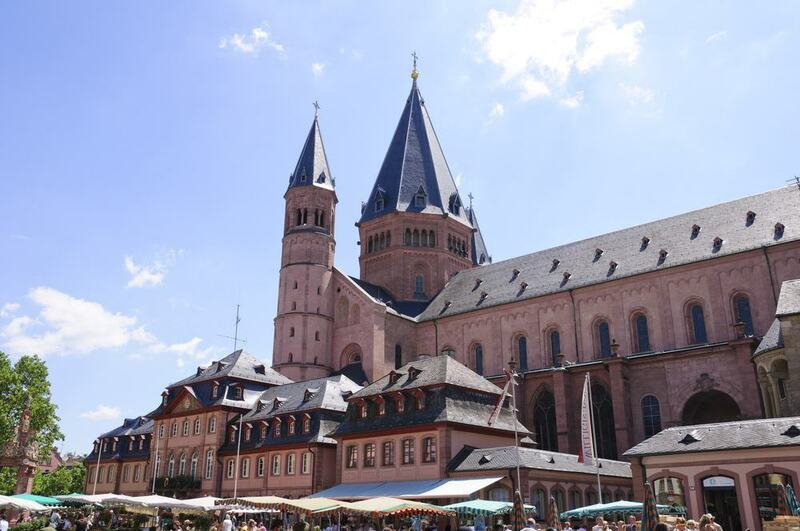 With a millennium of history in its walls, Mainz’s immense sandstone cathedral radiates religious and political power. The design is still mostly Romanesque from the High Middle Ages, but there’s also some Gothic and Baroque design in the chapels and roof. The interior has the largest set of funerary monuments to Prince-Archbishops in the former Holy Roman Empire. These monuments represent all phases of European art history, from Gothic to Baroque, as well as the Medieval revival styles of the 19th century. In the High Middle Ages six German monarchs, from Agnes de Poitou in 1043 to Heinrich Raspe in 1246 were crowned in the cathedral. Be sure to see the treasury, rich with centuries of religious art. The Gutenberg Museum was inaugurated in 1900 on the 500th anniversary of Johannes Gutenberg’s birth, and in 1927 moved into the delightful Renaissance townhouse, “Zum Römischen Kaiser” across the way from the cathedral. There are quite a few wonders to wow visitors in its galleries, including two of the 29 remaining copies of the Gutenberg bible, the first work that Gutenberg published. You can also see the earliest known example of woodblock printing, produced in Japan in 770, as well as other highly valuable works printed in the 15th century. One is “Peregrinationes in Terram Sanctam”, an illustrated travel memoir from a trip to the Holy Land, printed in 1483. The largest of the four squares around the cathedral, Markt is on the north side and developed with the cathedral in the 10th century. There’s a market trading here on Tuesday, Friday and Saturday mornings. You can also go in for a closer look at some of the monuments on the square: The Marktbrunnen (Market Fountain), is a highly ornamented Renaissance fountain, donated in 1526 by the Elector of Brandenburg. In front of the cathedral is the Gotthardkapelle, a Romanesque palace chapel ordered by Adalbert of Mainz in 1137. Lastly, the Heunensäule is a sandstone column in the centre of the square. This is one of 42 that was carved for the reconstruction of the cathedral after it burnt down in 1009 but never used. Only eight are known to survive today in different spots around Germany. Atop the highest hill in the old city, Stephanskirche was founded in 990 and has mostly Gothic architecture from the 1300s. A later extension was the beautiful Gothic cloister, added in the 15th century, with marvellous vaults on its south wall. And although the style of the building is much as it was in the Middle Ages, the church has come through a difficult 200 years: In 1857 an explosion destroyed the Baroque facade, while the church and its western belfry were only restored in the 1970s after taking damage in the war. The windows in the choir, famed for their blue tones, were redesigned by Marc Chagall between 1978 and 1985, and there’s nothing to compare to them in Germany. The church also has some Medieval fittings like an altar table from the 1200s and a sizeable tabernacle from the beginning of the 16th century. 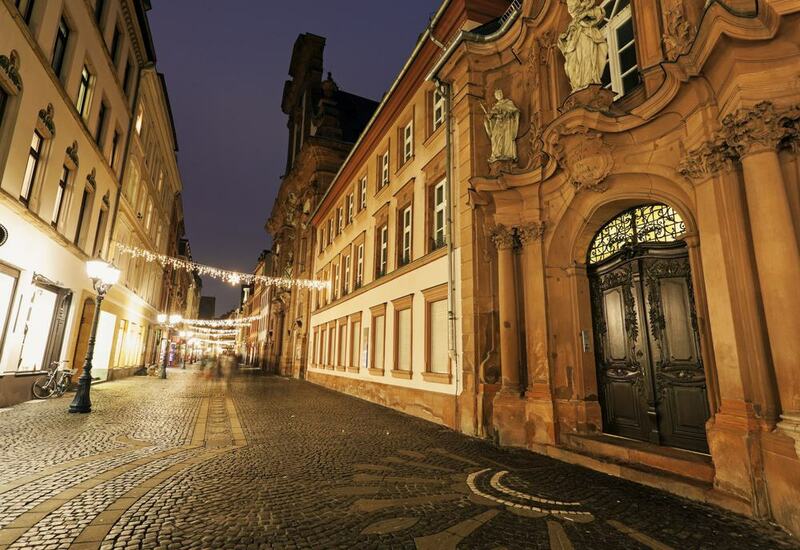 One of the prettiest scenes in Mainz is this small rectangular square enclosed by tall half-timbered houses. The square itself dates back to before 1329, while its houses are from the 16th to the 18th centuries. One, Zum Aschaffenberg is the oldest preserved half-timbered house in Mainz, built around 1500. In front of another fine old house, Zum Beimburg you can find the remains of a stump: This isn’t actually a cherry tree as it is often claimed to be (Kirschgarten means cherry orchard), but an almost petrified oak. At the centre, bordered by a restaurant terrace, is the Kirchgartenbrunnen, a fountain that has only been here since 1932 and is made with red sandstone repurposed from broken ornamental structures on the Theodor Heuss Bridge. A grand tree-lined square, Schillerplatz was already a public plaza in Mainz’s Roman era and was used as a marketplace in the Middle Ages. The square is fringed by regal palaces in the Baroque and Rococo styles housing state government offices. There’s a bronze statue of the poet and playwright Friedrich Schiller, put up on his 100th birthday in 1859. 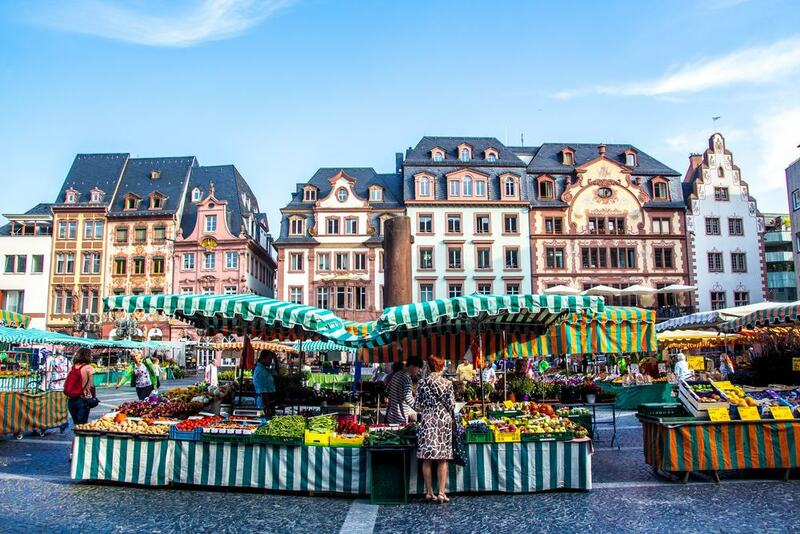 But the square’s most striking monument is the nine-metre-high Mainzer Fastnachtsbrunnen, which commemorates the famous carnival celebrations that take over the square on Shrove Monday. 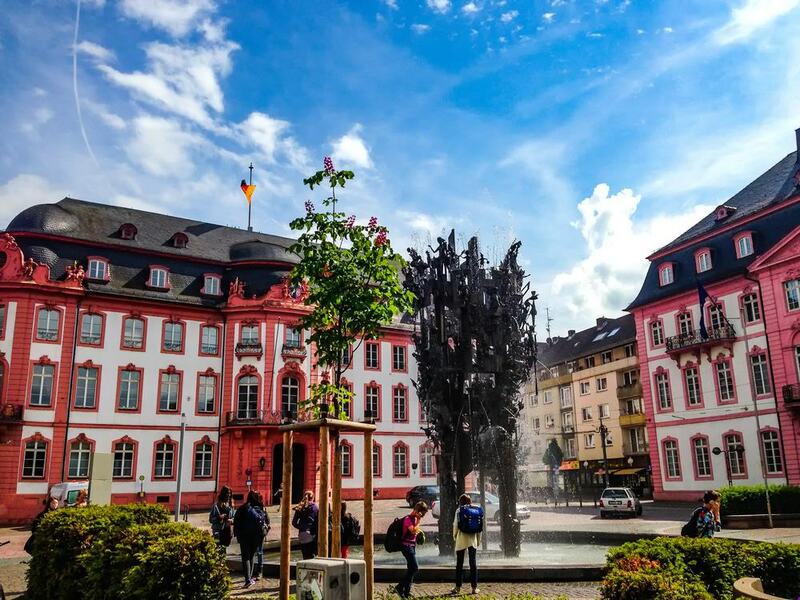 This fountain is a postcard favourite and is decorated with more than 200 bronze figures from Mainz history and local folklore. If you’re in the mood, you can walk beside the Rhine for hours, from Mainz’s Neustadt in the north to the railway bridge that marks the southern limit of the city in the south. In summer you won’t have to take more than a few steps before coming to a Biergarten with riverside views, an ice cream stand, or long lawns where you watch one of the world’s great rivers flow past. On the Stresemann-Ufer beside the Altstadt there’s a lovely perspective of the cathedral, as well as pieces of public art and a remnant of the city’s Baroque fortifications at the red sandstone Templertor. Built between 1768 and 1771, the Catholic Augustinerkirche is a Baroque masterpiece unaffected by the Second World War. Above the portal on Augustinerstraße look for the group of sculptures depicting the coronation of Mary between Augustine of Hippo and his mother Monica of Hippo. As the church was funded by wealthy patrons, the interior has almost overwhelming Rococo decoration, glinting with gilded stucco and dramatic frescoes glorifying the life of Augustine of Hippo. The church’s organ from 1773 is one of the few created by Johann Heinrich Stumm to make it to the 21st century, but there’s also one piece that looks a little out of place: In a niche between the southern side altars is an image of Maria with Child, carved in 1420 and brought here after its church burnt down in 1793. 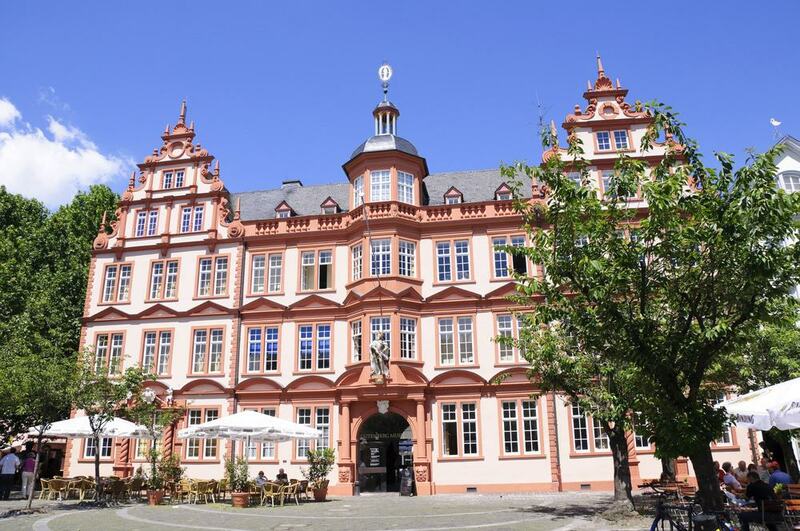 A museum of archaeology, art and culture, the Landesmuseum Mainz has a collection that begins in prehistory and comes right up to the 21st century. The attraction is in a Baroque former barracks building that was given a modern glass annexe in 2010. If you love Gothic and Renaissance art there’s much to uncover, like a cycle of paintings of Mary by Master of the Housebook, as well as works by Hans Baldung Grien and a stunning painting of Mary with Child by Lorenzo di Credi. A highlight in the medieval department is a gold and enamel fibula dating to 1000, depicting an eagle an encrusted with sapphires. The Baroque collection has refined pieces of furniture, like a Rococo writing desk designed by master craftsman Peter Schuß, adorned with gilded carvings and dainty walnut and cherry wood marquetry. In the early 1980s the well-preserved remains of several Roman war ships from the 4th century were found during construction work by the Rhine. These five vessels are the core of this museum’s exhibition and are from two different designs. There are also full-sized replicas to show what these boats would have looked like 1700 years ago. 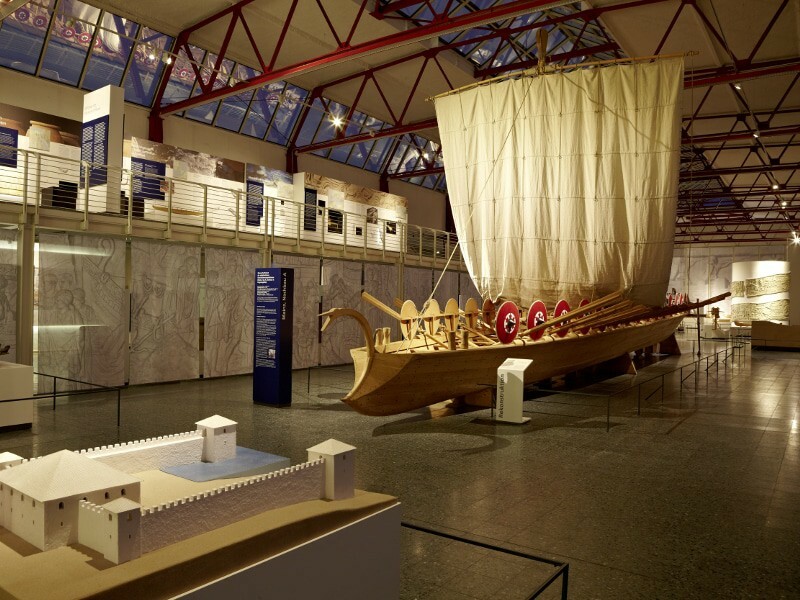 There are also models illustration the many types of craft that navigated the Rhine in Roman times, as well as riveting artefacts like a ship’s bronze bow spur from the 200s. The location also deserves mention as the museum is in the vast former repair hall of the Hessische Ludwigsbahn railway, dating to 1870. When the Römerpassage shopping mall was being built in the late-1990s workers happened upon a sanctuary devoted to Isis and Cybele that had been used until the 3rd century. A small but diverting museum was later set up in the basement of the Römerpassage around the ruins. There’s a raised glass walkway, allowing you to look down into the remnants of the sanctuary, which is labelled with information boards. Along the walls are glass cases full of the interesting finds made on the site. Among them are some of the hundreds of clay oil lamps discovered here, as well as animal sacrifices, curses inscribed on lead tablets and statuettes of Mercury and Venus. The main vestiges of Mainz’s defensive wall are two towers a few hundred metres apart on Rheinstraße. Both were raised in the 1200s and have a Late Gothic design from the early 1400s. The pair were damaged in the war but were restored in the 1961 to celebrate Mainz’s 2000th anniversary. These lofty buildings were used as gatehouses, watchtowers and prisons. 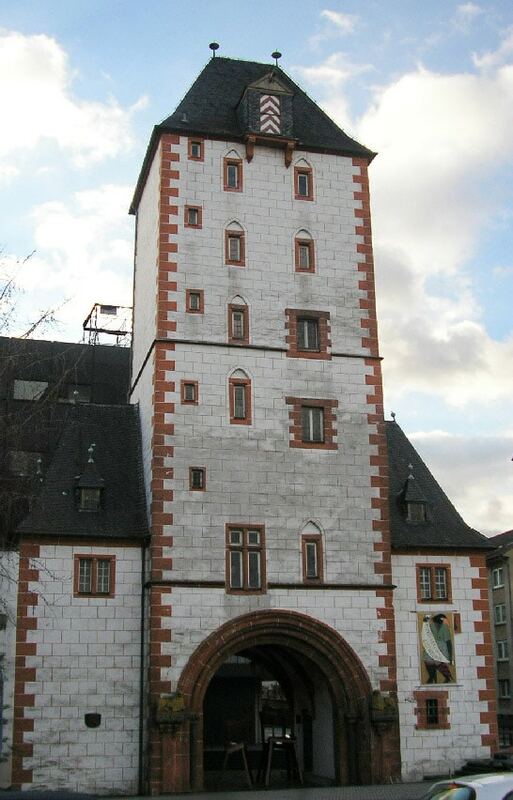 The wooden tower held one of the most famous outlaws in German history, Schinderhannes, who was locked up here after a spree of daring robberies and an escape from jail. Following 15 months in prison he was guillotined by the French authorities in 1803 in front of a crowd of 40,000. 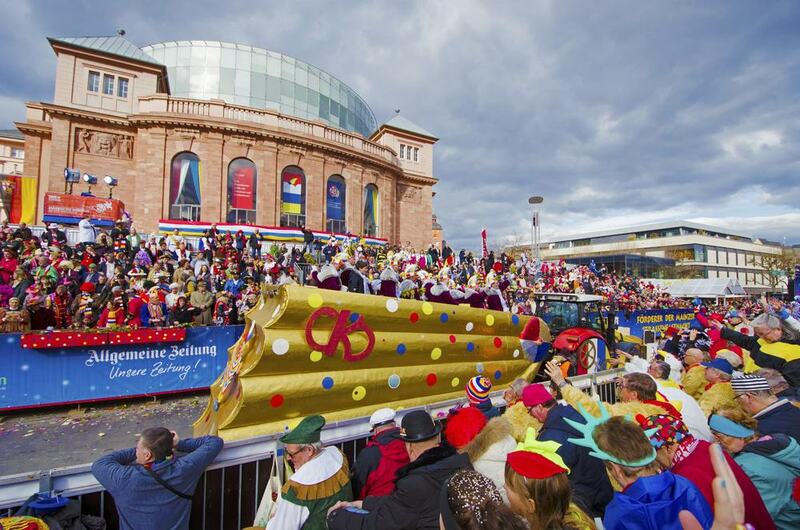 Carnival season in Mainz begins on 11 November and continues right the way through to Shrovetide in February or March. There are small events happening throughout this time, but the everything ramps up for the days leading up to Ash Wednesday. Shrove Monday is definitely the day to be in the city, so long as you don’t mind crowds, as 500,000 spectators line the streets for the Rosenmontagszug parade. There are almost 10,000 participants in the procession that snakes past the sights in the Alt Stadt. The parade in Mainz is famous for its wit, and floats carry enormous satirical set pieces with an irreverent take on world affairs. Even though they were playing amateur football just 30 years ago, the local football team has been a constant presence in the Bundesliga since 2010. 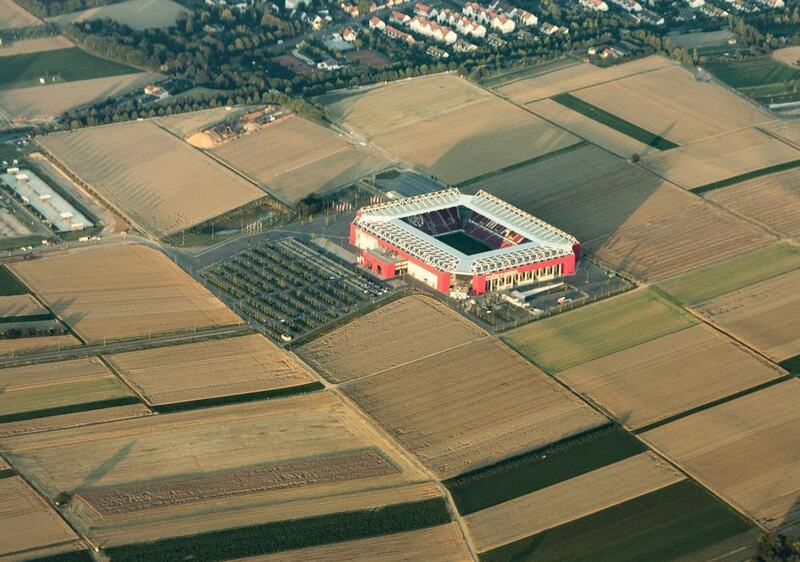 In 2011 the club moved into the new 34,000-capacity Opel Arena, which is a superb place to watch a football match, with high tiers and a cacophonous noise created by 15,000 standing fans. The club also infuses local carnival culture into matches: Whenever Mainz score they play the Narrhallamarsch, which is the signature tune of the Mainzer Fastnacht. If you can’t catch a match but want to see inside the stadium there are multilingual 90-minute tours on Fridays at 17:00, taking you around the dressing room, dugouts, corporate hospitality boxes and the conference room. If you fancy trying something local, Spundekäs is as authentic as it gets in Mainz. 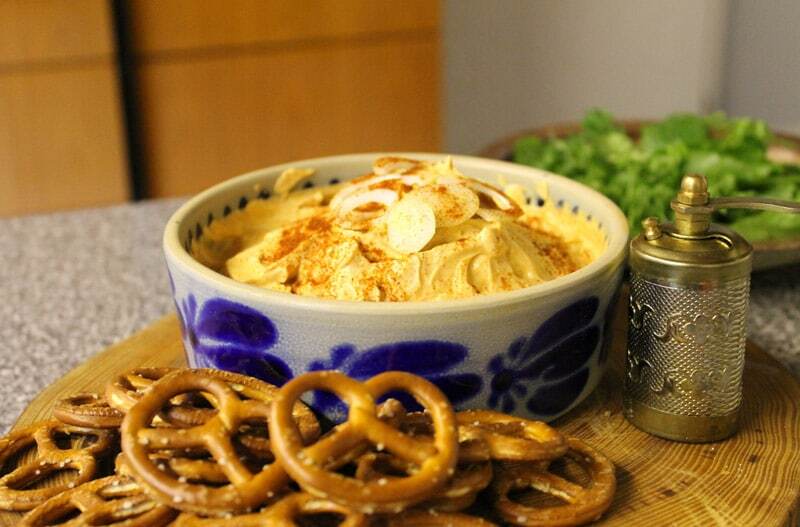 This is a smooth cheese paste, partly made from quark and seasoned with pepper, salt and sweet paprika. When you order Spundekäs it will normally come with chopped onion sprinkled on top and with crackers and mini pretzels on the side for dipping. The perfect match is Riesling or Müller-Thurgau wine, from the surrounding Rheinhessen region. Another cheese that is a bit more challenging is Handkäse, which is often marinated in vinegar and has a powerful aroma.